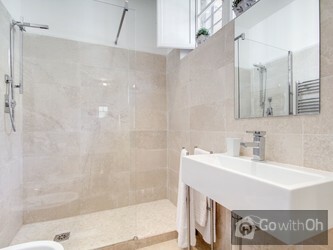 This apartment is located in an elegant historic building with a concierge service. The decoration is characterized by light colors (white and ivory), the light brown parquet flooring in all environments and the classic furniture, give the whole apartment an atmosphere of peace and serenity. It is the perfect apartment for a large family or two couples, thanks to the presence of two double rooms (two beds in the second bedroom can be joined to form a double bed) and two bathrooms, which guarantee the privacy of each Opsite. We are in the center, in the very heart of one of the most famous neighborhoods in the world, the Vatican, surrounded by shops and restaurants, cafes, pizzerias and ice cream parlors. The strategic location allows us to reach all places of tourist and historical interest that the city offers. The Ottaviano Metro Station is around the corner, and the taxis and buses in the nearby Piazza Risorgimento. From 20:00 to 22:30, supplement of 30 . From 22:30 to 01:00, supplement of 50 . Der absolute Wahnsinn, die Kontaktperson war sehr sehr freundlich, wir waren mehr als zufrieden! Die Wohnung ist wunderschön, sauber, gut gelegen, es hat alles gestimmt! Excellent score on all accounts. Highly recommended! We will recommend our family and friends when they visit Rome. Thank you! Piacevolissimo soggiorno,tutto come previsto. La persona di contatto gentilissima come l'agenzia. 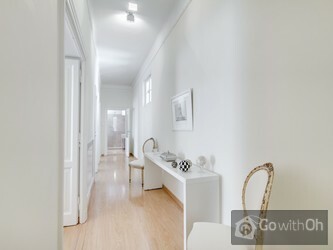 A beautiful apartment in a very convenient location - would recommend to anyone! El día de la llegada la calefacción no estaba lo suficientemente alta, pero tras comunicárselo a la persona de contacto, lo arregló en seguida y funcionó perfectamente durante toda la estancia. El resto todo estuvo estupendo. Zona agradable, cerca del metro, supermercados cerca, persona de ...contacto con mucho interés de que estuviéramos bien y dispuesta a resolver cualquier problema. Estimado Cliente, Desde Oh le damos las gracias por sus comentarios. Le informamos de que la calefacción del apartamento es centralizada y funciona en determinados horarios del día (por los horarios consultar la información del apartamento), si no fuera suficiente el apartamento dispone también de bomba de calor caldo/frio que se puede activar a cualquier hora. 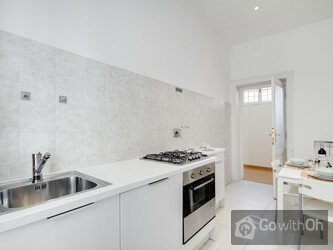 El apartamento está decorado con un gran gusto y la propietaria R. es un encanto.El apartamento es muy amplio y está a dos minutos de la plaza se San Pedro en el Vaticano y a veinte minutos andando a Piazza Navona, boca de metro a dos minutos andando. La zona es estupenda es tranquila y ...bulliciosa al mismo tiempo, con todo tipo de servicios y tiendas . Todo estupendo, como unico pequeño inconveniente me hubiera gustado que el apartamento hubiera tenido puesta la calefaccion al llegar y no esa sensacion tan fria al entrar, luego los dias posteriores funcionaba genial y se estaba muy a gusto. Estimado Cliente, Desde Oh le damos las gracias por sus comentarios. Le confirmamos que el apartamento dispone de calefacción centralizada que funciona en determinados horarios y la noche no se activa, pero los clientes siempre pueden activar las bombas de calor/frio disponibles en el apartamento sin limitación de horarios. Nos recibió R., la dueña, que es una persona muy agradable. El departamento está muy bien ubicado a cinco minutos a pie de El Vaticano, es espacioso y tranquilo. La única observación tiene que ver con un problema que tuvimos con el agua caliente, pero la dueña mostró excelente disposición para resolver y suponemos ya estará superado. Abbiamo soggiornato a Roma nel periodo di Pasqua. L'appartamento e' grande, luminoso e accogliente e la sua posizione e' ottimale per visitare il centro di Roma e il Vaticano. La Proprietaria e' stata perfetta in tutti i sensi. Ci ritorneremo!!! Die Ferienwohnung ist sauber, gut ausgestattet und wirklich phantastisch gelegen. Ein paar Minuten bis zum Petersplatz, eine Viertelstunde bis zur Piazza del Popolo. Einen Supermarkt (Billa) gibt es in der Via Cola de Rienzo. Ebenfalls praktisch um die Ecke. R. die Vermieterin, ist sehr ...freundlich und hilfsbereit. Wir haben die Tage in Rom sehr genossen und werden ganz sicher wieder kommen. The accommodation was clean, well-equipped and of a very high standard, light, airy and spacious. The beds were extremely comfortable and the bathrooms were immaculate. R, the owner was so helpful and welcoming. Our party included an 8 year old, teenager and grandma, plus I am 25 weeks pregnant.... There is a great market the next street away, several good places to eat, a supermarket within close proximity and the metro is close by for getting to Colosseum etc. The Vatican is within easy walking distance and crossing the river to Piazza Navona is a pleasant stroll. When returning to Rome we would absolutely book this beautiful apartment again! Il manque une grande cafetière. Un microonde.et un miroir dans le couloir pour les dames.sinon tout est parfait. Very good central location, comfortable apartment (large and light) with everything what you need for every day life. It's very good variant for spending holidays in Rome! Appartement war sehr sauber und schön eingerichtet. Vermieterin sehr nett. Es hat alles Super mit der Übergabe des Schlüssels geklappt. Super Lage. Ist sehr gut weiter zu empfehlen. This property was fantastic. I cannot say anything negative about this property and recommend this to anyone planning to stay in Rome. It is less than 5 minutes walk from Vatican City and it easily accommodates 6 adults. el apartamento es precioso, la ubicacion inmejorable a 200 m del Vaticano y a 100 del metro, la propietaria un encanto...un sitio muy muy recomendable, nos ha encantado nuestra casa romana, gracias R.
Decoración espléndida y excelente ubicación. La dueña, sumamente amable y atenta. Heel mooi en ruim appartement vlakbij het vaticaan. De kamers zijn met zorg ingericht. R., de eigenares van het appartement, is heel vriendelijk en behulpzaam. Een echte aanrader. Very good location close to Metro, accommodation well-appointed, comfortable and spacious. Neighbourhood residential and quiet. Host extremely friendly and very helpful. Highly recommended! R. fue muy amable. El aparamento es genial y esta muy cerca del varicano. Lo pasamos genial, y no hubo contratiempos... Si volvemos a roma espero poder disfrutar de nuevo de tan lindapartamento. Gracias r., nos sentimos como en casa. Lovely apartment, decor calming after madness of the city. Great to have two bathrooms. WiFi great. Cooked a meal easily in the kitchen. Great location as felt as if you were in the real Rome! 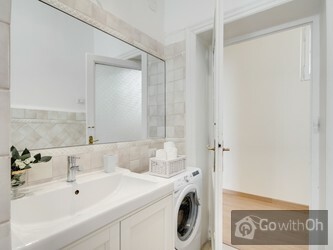 Lovely well appointed apartment, very close to the Vatican. Owner R was most helpful on arrival as we were after the check in time. I would recommend this apartment to anybody who was thinking of staying in Rome. Very pleased with it. tres bel appartement spacieux et bien situé , de plus la propriétaire est très sympathique et de bon conseil? We found the apartment very clean and had enough room for 5 people. The location was fantastic and there were plenty of places to eat. R was very friendly and answered all questions promptly. I would recommend this apartment for families. The apartment is located at a convenient distance from the metro. Apartment was very clean and the owner was very friendly and helpful. It's kept very clean and is as-is in the snaps provided on the website. Would highly recommend this apartment. Must visit the restaurants suggested by the owner ...L'isola della pizza" in via degli Scipioni n. 45 and "ai Balestrari" in piazza dell'Unità n.27. Appartement situé à proximité des restaurants, métro et autobus, du Vatican. Secteur sécuritaire et agréable. J'y retournerais volontiers. Appartement bien agréable et conforme à ce qui apparait sur l'information donnée sur le site de location. Excellent accueil et disponibilité de la part de la propriétaire. Logement très agréable et confortable. À conseiller sans hésitations. Ubicación, amabilidad de la propietaria , amplitud del apartamento y comodidad, perfecto. Posizione ottima nel bel quartiere Prati, appartamento grande e luminoso e fornito d tutto, la proprietaria signora R. e` stata di una gentilezza squisita. Siamo venuti per il matrimonio di nostra figlia e ci ha atteso con un bouquet di rose bianche per la sposa, ci ha trovato uno specchio intero ...(che mancava nell'appartamento) affinche` la sposa potesse specchiarsi e ci ha permesso di rimanere ben oltre l'orario del check out il giorno della partenza (successivo al matrimonio). Torneremo! Appartement idéalement situé dans un quartier calme .Équipements intérieurs sans faille.A recommander. Ubicación perfecta,el apartamento tal y como aparece en las fotografías.Gracias por todo R!!!!! Nice apartment, great location, owner very friendly and helpful. Great apartment, very helpful owner. We had a great time here, and would definitely stay again next time in Rome. This was the perfect apartment for my family (husband and 2 teenagers). It was clean, large and relatively quiet. It was close to the Metro, Vatican and Piazza Navonna. R. was very nice and helpful. Check in and out was professional and easy. I would stay here again. I was very happy with everything, the landlady was very nice and helpful and we really liked the apartment. Definitely recommendable. Propriétaire très gentille et très avenante. Lits très confortables. Situé près du Vatican. Par contre, mobilier de cuisine primaire....le siège des chaises étaient amovibles. Eau pas très chaude. Appartement typiquement italien avec des plafonds hauts et architecture européenne. Bien rénové et propre. Agréable séjour! Notre hôte a été très gentille et a pris tout son temps pour bien nous expliquer le fonctionnement. Die Wohnung ist hell, sauber, stilvoll und geräumig. Die Lage außerordentlich schön und funktional. Eine sehr nette Kontaktperson wies uns in die Wohnung ein. Wir haben dort mit unserer Familie wunderschöne Tage verbracht! Ich kann die Wohnung nur empfehlen. Für 4 Personen ist sie sehr geräumig. Die Lage ist top. Die Wohnung liegt in einer Seitenstraße, so dass es sehr ruhig ist und vom Treiben auf den Hauptverkehrsstraßen ist nichts zu hören. Zur U-Bahn sind es max. 5 min. Gleiches gilt für den Vatikan. Auch ...die Vermieterin ist sehr bemüht und sehr freundlich. Auch ist sie gerne behilflich wenn es um Restauranttipps oder ähnliches geht. Wir kommen bestimmt wieder. 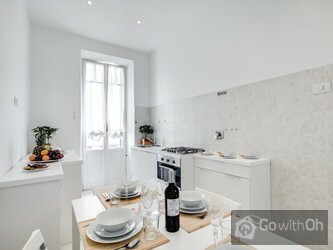 This is a great apartment / base for a stay in Rome. The owner R is so helpful with meeting and showing you around. The immediate area has good options for dining out and picking up groceries. 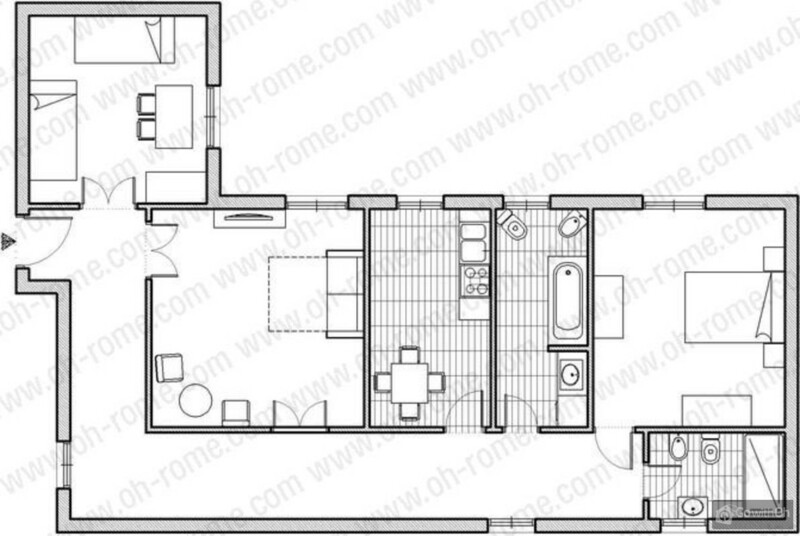 The apartment is spacious and clean and a very comfortable base for a stay in Rome. Highly Recommend! Our contact R was great and extremely flexible (sacrificed her Sunday and enabled a late checkout). Spacious appartment. Perfect location, vivid life in the streets and plenty of restauranst & shops - nevertheless not overcouded by tourists. VERY ROME! Thanks. Die Kontaktperson, R, war überaus freundlich und hilfsbereit. Die zentrale Lage der Wohnung, die Nähe zum Vatikan und die kleinen, feinen Restaurants in der Nähe haben sehr zum Gelingen des Kurzurlaubs beigetragen. Die Wohnung ist zweckmäßig aber völlig ausreichend eingerichtet. Wir kommen gerne wieder. Proprietario molto disponibile. Ottima posizione. Appartamento molto grande e luminoso, pieno di ogni confort compresa Tv Satellitare SKY. Manca la tendina nel bagno con la vasca e quindi con una doccia immancabilmente si bagna a terra.. Consigliato. Everything was perfect in the apartment. It was really clean and warm although it was really cold in Rome those days.The location is really good, very near Vatican and the subway, so helpful if you want to visit as much as possible.The owner R was very nice and helpful and although we didn't need ...to ask for any help we felt she was there for anything we could need. 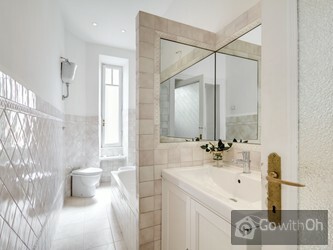 We will always recommend this apartment to anyone that may want to visit Rome.